Photograph, Kendal Castle, Kendal, Westmorland, by Herbert Bell, photographer, Ambleside, Westmorland, 1894. Vol.2 no.157 in an album, Examples of Early Domestic and Military Architecture in Westmorland, assembled 1910. 157. Kendal Castle. Kendal. K.
Photograph, Kendal Castle, the Round Tower, Kendal, Westmorland, by Herbert Bell, photographer, Ambleside, Westmorland, 1894. Vol.2 no.158 in an album, Examples of Early Domestic and Military Architecture in Westmorland, assembled 1910. 158. 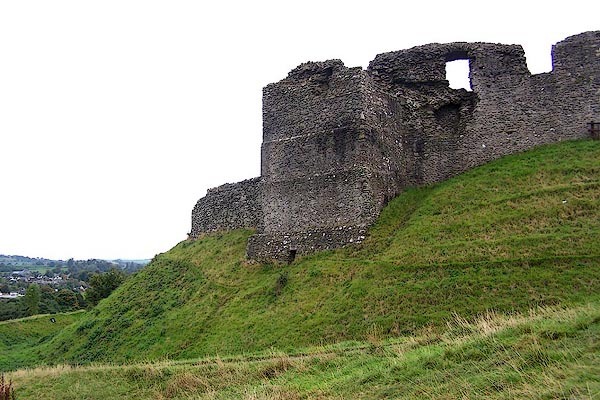 Kendal Castle. The Round Tower. Kendal. K.
Engraving, Ruins of Kendal Castle, drawn by T Binns, engraved by O Jewitt, on p.70 of A Descriptive Guide of the English Lakes, by Jonathan Otley, 8th edition, 1849. Engraving, Kendal Castle - The Keep, drawn by T Binns, engraved by O Jewitt, on p.86 of A Descriptive Guide of the English Lakes, by Jonathan Otley, 8th edition, 1849. "... About half a mile of on the east side of the town [Kendal] is on a hill a park longing to young Mr Par, the chiefest of that name, and there is a place as it were a castle." On the east of Kendal. Taillebois, baron of Kendal, is the first after the conquest who was honoured with the command of this [Lancaster] castle; and William de Taillebois in the reign of Henry II, obtained leave to take the surname of Lancaster. It is therefore probable that the barons of Kendal either built or repaired the ancient castle, in which they resided, until they erected, upon the summer site of the station of Concangium, their castle at Kendal; for the remains of some of the bastions there [Kendal] agree in style with the towers here [Lancaster]. The castle he [Mr Gray] describes thus:- 'The remains of the castle are seated on a fine hill, on the side of the river opposite to the town; almost the whole inclosure-wall remains, with four towers, two square, and two round, but their upper parts and embattlements are demolished: it is of rough stone and cement, without any ornament of arms, round, inclosing a court of the like form, and surrounded by a moat; nor ever could it have been larger than it is, for there are no traces of out-works. There is a good view of the town and river, with a fertile open valley through which it winds. the only way to it when in its glory, and is the easiest at present, he would have observed a square area that had been fortified with a deep moat, and connected with the castle by a draw-bridge, where was probably the base court. The stones are now entirely removed, and the ground levelled, 'and laughing Ceres reassumes the land.' The present structure was undoubtedly raised by the first Barons of Kendal, and probably on the ruins of a Roman station; this being the most eligible site in the country for a summer encampment, and at a small distance from Watercrook. There are still some remains of a dark red freestone, used in facings, and in the doors and windows, and have been brought from the environs of Penrith, more probably by the Romans, than by either the Saxon or Norman Lords. Fame says this castle held out against Oliver Cromwell, and was battered from the Castle-law-hill, but this is not so probable, as that its present ruinous state is owing to the jealousy of that usurper. or embattlements are demolished; it is of rough stone and cement, without any ornament or arms, round, inclosing a court of like form, and surrounded by a moat; nor could it ever have been larger than it is, for there are no traces of out-works. There is a good view of the town and river, with a fertile open valley, though which it winds. ... At a little Distance from the wooden Bridge [in Kendal] are the Ruins of a Castle, in which Catherine Parr, the sixth Wife of Henry VIII. was born. Circle, tower, in a park - ring of fence palings, trees. castle walls around the castle building. drawing of castle walls around the castle building. Buildings and tower with flag, in a ring of fence palings with trees. Castle, in a park, fence palings, trees. Print, engraving, Ruined Tower, Kendal Castle, Westmorland, published by John Johnstone, Paternoster Row, London, et al, 1847. On p.20 of Sylvan's Pictorial Guide to the English Lakes. Print, engraving, View of Kendal Castle, in Westmorland, engraved by Lowry, published by Alexander Hogg, 16 Paternoster Row, London, 1780s? Lowry sculp. 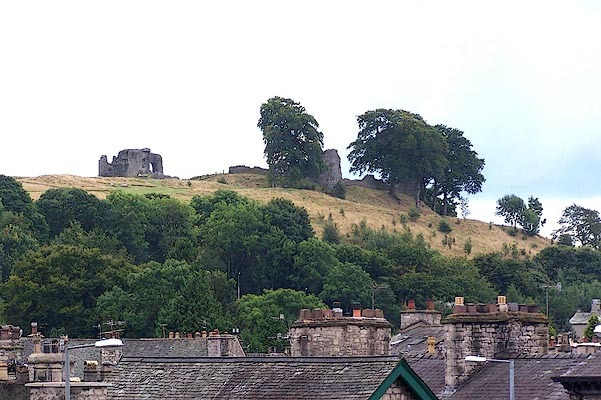 / View of KENDAL CASTLE in Westmorland. / Published by Alexr. Hogg No.16 Paternoster Row. Print, uncoloured engraving, Kendal Castle, published by Hudson and Nicholson, Kendal, Westmorland, 1832. Tipped in opposite p.70 of The Annals of Kendal by Cornelius Nicholson. Print, engraving, Ruins of Kendal Castle, Kendal, Westmorland, by A Haselgrave, published by Edmund Bogg, 3 Woodhouse Lane, and James Miles, Guildford Street, Leeds, Yorkshire, 1898. Included on p.226 of Lakeland and Ribblesdale, by Edmund Bogg. Kendal Castle -- Kendal -- Kendal -- Cumbria / -- 'As it was' in the 15th century. Kendal Castle -- Kendal -- Kendal -- Cumbria / -- 'As it is' 1800.
hearsay Built by William Rufus, 13th century. It was owned by Thomas Parr father of Katherine Parr, who was probably not born here but lived here as a child. When Katherine's brother died without an heir, 1571, the castle was abandoned.